High-capacity ultrafiltration technology from inge GmbH, a subsidiary of BASF SE will be supplied for a desalination plant in Jamnagar (India), the company announced. Under the project, said to be the biggest in the company’s history, more than 4,000 modules from the T-Rack 3.0 series will provide 450,000 cu m of pretreated water per day to one of the country’s largest oil refineries. The desalination plant is built by IDE Technologies, one of the world’s leading water treatment specialists, and will use inge UF to protect the sensitive reverse osmosis membranes and to minimise the energy footprint of the plant. After multiple sea water pretreatment steps, the desalination plant will deliver up to 170,000 cu m of process water per day. The German-made modules are scheduled for delivery by the end of this year. The entire desalination plant is scheduled for commissioning in 2015 and represents one of the biggest ultrafiltration plants currently being built anywhere in the world. “The Jamnagar project is a landmark in our company’s history. It demonstrates that inge ultrafiltration membrane technology delivers exceptional performance at large-scale for multiple industries in need of innovative, sustainable and cost-effective solutions for water filtration,” emphasises Steis. Professional water treatment and environmentally beneficial water recycling are taking on increasing importance, particularly in water-stressed regions. inge ultrafiltration technology helps in promoting the sustainable use of the valuable resource water. 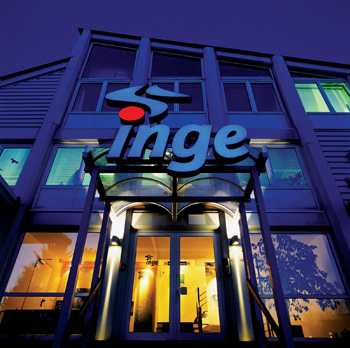 inge GmbH, based in Greifenberg, Germany, is a world’s leading provider of ultrafiltration technology, a membrane process used to treat drinking water, process water, wastewater and sea water. With a global reach enhanced by its network of partners, the company has completed numerous reference projects around the globe featuring its cutting-edge technology. In August 2011, inge became part of BASF, the world’s leading chemical company. Its range of products include highly-efficient ultrafiltration modules and cost-effective, space-saving rack designs as the core components of water treatment plants, rounded off by the superb technical support it provides to its customers. All the company’s products are based on the in-house development of its patented Multibore membrane technology, providing the top-quality standards for which German-made goods are known. The extremely small-pore filters of the Multibore membrane reliably intercept not only particles, but also microorganisms such as bacteria or even viruses, thereby providing a dependable source of clean water. Deployment of the inge technology also offers significant advantages over conventional water treatment methods, such as rapid and easy module installation and stable, highly resilient membranes. This makes planning a water treatment facility much simpler, enabling customers to achieve low-cost installation and operation. And all this comes with a guarantee of long-lasting reliability. BASF offers a wide range of solutions and products for the water, oilfield and mining industry. The product range of Global Water Solutions includes products used in the key processes of industrial and municipal water treatment.